I always struggle when it comes to making pork chops. I’m not sure why but it’s one of the cuts of pork that I usually avoid buying. There was a great sale on chops that I couldn’t pass up and figured I would give them another shot. This was a great recipe for that! The honey pecan sauce was delicious and brought so much depth to the pork. I know this will definitely be another recipe we’ll be making! Pat the pork chops with a paper towel to remove some of the moisture. Season both sides with salt and fresh ground pepper. Dredge the chops in the flour. In a large skillet, melt the butter over medium-high heat. Once the butter is melted, place the chops in the butter and brown on both sides. While the chops are cooking, mix together the honey and chopped pecans in a small bowl. Once the pork is browned on both sides, add the honey and pecans to the skillet. Cover and reduce the heat to low and simmer for 8 minutes until the pork is done. 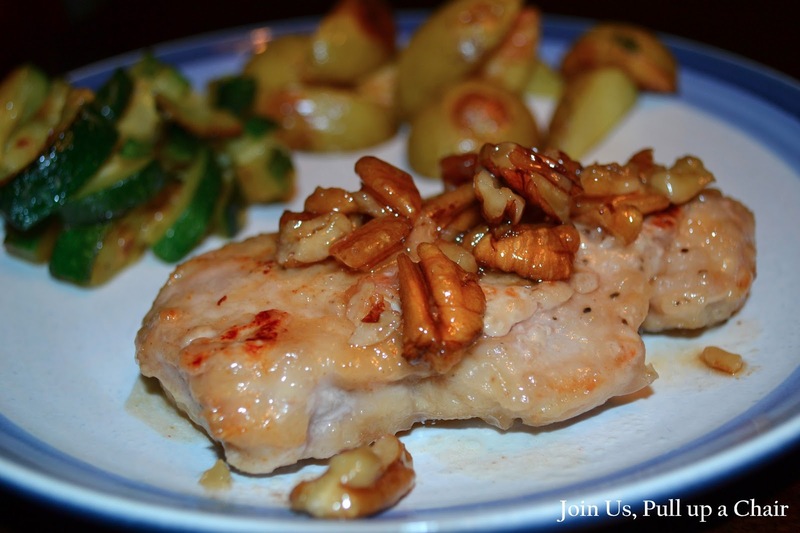 Serve the pork drizzled with the honey-pecan sauce.